"Emma is now 1 year old and her temperament has mellowed somewhat. She is still very excitable when meeting new people (as always, both 2- or four-legged). She does not show any of the Griffon traits related to hunting rodents. In fact, she finds squirrels and rabbits both to be wonderful playmates when she is loose in a fenced area. Her core operating system command seems to be, “All living things must be licked!” She remains fairly self-willed, but is responsive to commands “most” of the time. It is clear that she knows what is wanted, but she seems to pick and choose when to listen. For people interested in an Eskifon, the closest description of Emma’s temperament would be that of the Petit Basset Griffon Vendeen. Not all, but most of the description of that breed’s temperament would apply to Emma, especially the need to be leashed or contained at all times. She is just too interested in every other living being." The Eskifon is not a purebred dog. 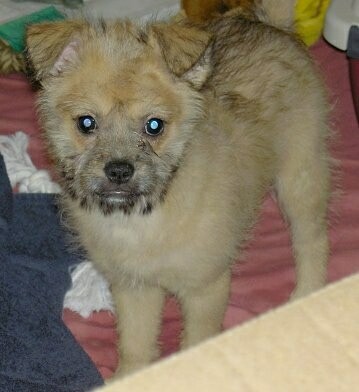 It is a cross between the American Eskimo and the Brussels Griffon. The best way to determine the temperament of a mixed breed is to look up all breeds in the cross and know you can get any combination of any of the characteristics found in either breed. Not all of these designer hybrid dogs being bred are 50% purebred to 50% purebred. It is very common for breeders to breed multi-generation crosses. Emma the Eskifon (American Eskimo / Brussels Griffon hybrid) puppy at 17 weeks old—"This is Emma von Puppyhead (yes, we have a whimsical sense of humor). Her appearance and coloring changed almost weekly in her first few weeks. She was initially very dark, with quite a bit of black fur along her back. This gradually turned white and then faded entirely around 4 ½ months. Her overall color gradually changed from golden to tan to red and then yellow and has finally settled into what seems a permanent golden color with a few dark highlights. At one point she was such a light yellow that she would appear almost white in the sunlight. People purchasing an Eskifon should be aware that their appearance will be changing. Grooming also has a big effect on their appearance and can highlight the traits of either the Griffon or Eskimo. At 5 ½ months she is already 12 lbs., the same weight as her sire; the dam was only 8. We don’t know how big she’ll grow yet. She is INCREDIBLY smart, perhaps too smart for our own good. However, she was housetrained within 2 days and learns any trick almost immediately. She is, however, very self-willed and can be temperamental. She is very friendly, outgoing and good natured with both other dogs and humans, to the point where self-control is a problem when encountering new people of either the two-legged or furry varieties."